Walk into a wine shop this time of year and you’ll find boxes of pale rosés front and center, emblazoned by stickers enticing you with steep discounts. Their pleading shelf-talkers seem to say ‘Please, buy me now, before it’s too late!” The yearly early fall rosé giveaway can be so blatant that customers making their way to the Rombauer and Prisoner might wonder what’s up (or wrong) with all that rosé. Nothing at all, it turns out. The kids are back in school, summer tans are starting to fade and the working world has gone back to firing on all cylinders. But must we give up on rosé, the ultimate symbol of summer indulgence and chill? Heck no! Stretch your summer spirit into fall with satisfying rosés that are sturdy enough to make the transition into the cooler months and beyond. We’re talking dark and yes, meaty rosés. They do exist – and they are delicious. And they are most definitely dry, not sweet. While summer rosé styles work great with lighter summer fare, even barbeque, darker rosés saddle up to savory fall dishes and even winter’s comfort foods. So what are these darker fall rosés? One is Italy’s cerasuolo, a rosé that’s often translated as ‘cherry red’ or ‘cherry-based,’ pronounced chair-a-SWO-low. 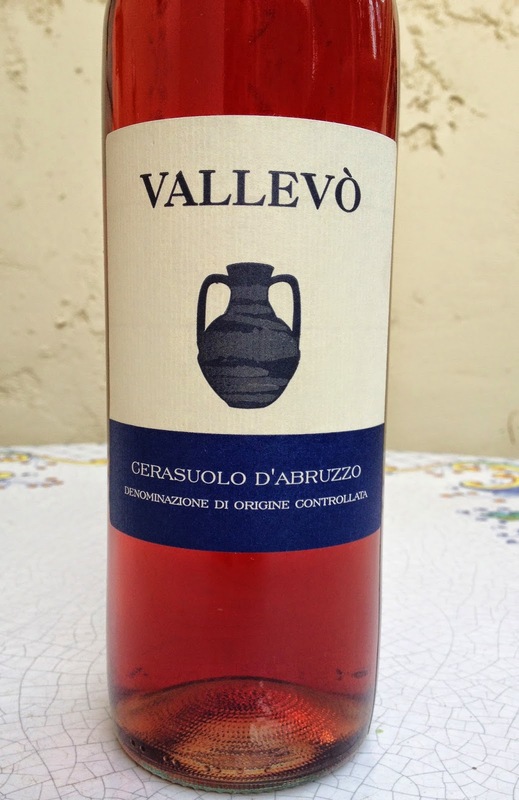 Rosé wines labeled ‘Cerasuolo d’Abruzzo’ come from mid-southern Italy’s Adriatic coastal province of Abruzzo. Despite limited skin contact time, these cerasuolo rosés are darker than your typical rosé. They also have a different flavor profile and it’s that difference that makes cerasuolo rosés so perfect for fall fare. Cerasuolo rosés get their more intense reddish color from skin contact of the juice of crushed grapes that give up their color (and yes, tannins) more readily than other grapes. Count among these Montepulciano (the grape, not the region) and similarly styled rosés made from Malbec, Bobal and Cabernet sauvignon, among others. The flavors and heft of these fall rosés differ from the watermelon-red cherry-raspberry-strawberry profile you might expect from summer rosés. Instead, Cerasuolo d’Abruzzo wines are brooding rosés. They’re chock-a-block with darker red fruit flavors, moderate acidity and more pronounced earthiness with a bit of a bite on the finish from the tannins you might expect from their Montepulciano or other assertive grape origins. And, because any talk of Italian wine has to be confusing, know that Sicily’s only DOCG (Denominazione d’Origine Controllata e Garantita) wine is Cerasuolo di Vittoria. Not a rosé at all, this is a red wine made from Sicily’s Nero d’Avola and Frappato grapes. So before you swear off rosés until the spring of 2015 or later, try a cerasuolo d’Abruzzo or a rosé of Cabernet before casting off the pleasures of rosé for half a year. The Vallevò pictured is a charming Cerasuolo d’Abruzzo made from the indigenous Montepulciano grape (not to be confused with the Tuscan town of the same name and the Tuscan wine, Vino Nobile di Montepulciano, made from Sangiovese). Medium-red in the glass and with herb-inflected, black cherry aromas, it is earthier and more rustic than your typical rosé. This is a wine that is burly enough to stand up to heartier pasta dishes and meaty fishes, not to mention Pinot-friendly meats such as pork and lighter stews and burgers. Vegetarians and vegans will also enjoy cerasuolo and heartier rosés with more complex plant-based dishes, especially those kissed by a touch of umami such as mushroom dishes or vegetables set off by soy-based dressings. Find the Vallevò Cerasuolo d’Abruzzo for only $6.25 (and ridiculously, even less if you are a wine club member, which we definitely recommend) at 3rd Corner WineShop and Bistro in Palm Desert and other San Diego area locations. Dan’s Wine Shop, also in Palm Desert, often has South Africa’s Mulderbosch rosé of Cabernet sauvignon in stock, which we also offer seasonally at Cooking with Class. Check out Costco too, for Susana Balbo’s rosé of Malbec from Argentina or seek out a rosé of Bobal from Spain at budget prices at Trader Joe’s – they’re guaranteed to up-end your ideas about light and ethereal rosés. LA Wine Company offers a great selection of many types of rosés, including rosés from producers you probably know from their better-known reds and red blends. This fall, give one of these meaty rosés a swirl. With each sip, you’ll keep your sweet summer memories alive, even as you flip on that oven to herald the arrival of autumn. Rose is my favorite wine and Abruzzo offers some really exquisite sorts.